If you are looking for the ‘vintage analog sound’ to add warmth for your tracks, the Nomad Factory Analog Signature Pack is the best way to do it. Starting today until the end of September you can pick up the Pack for only $49, that’s a saving of over 80%. The individual plug-ins from the Pack are also on sale at $29, instead of the usual $129. Limiting Amplifier LM-662 is available on promo at the DontCrack Store. Program Equalizer EQP-4 is available on promo at the DontCrack Store. Studio Channel SC-226 is available on promo at the DontCrack Store. 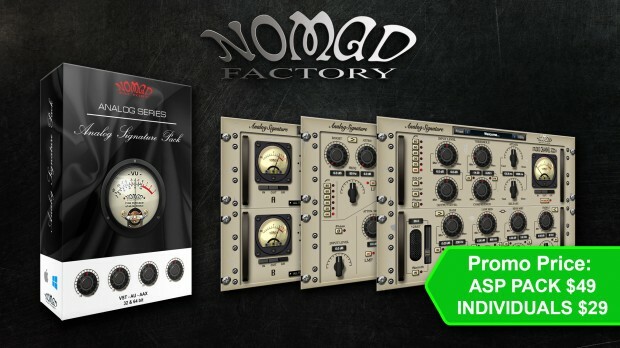 The Nomad Factory Studio Channel SC-226 is a stereo channel recording plug-in, featuring four band equalizer, an analog “signature” optical compressor and at the heart of the shelving and bell filters, a tube simulator and Brick-Wall peak limiter designed to reproduce the warmth of vintage recordings with unrivaled quality and realism. The Studio Channel is tube style virtual equalizer / compressor. It is equally suited for delicate vocal as well as dynamic instrument recordings such as lead guitar, bass guitar, drums and horns. The algorithm was designed to emulate the response of a high-end vintage analog equalizer/compressor. Exceptional for tracking, mixing or mastering, the Studio Channel recreates the warm sound qualities of its analog hardware ancestors. This entry was posted in Audio Software, Plug-ins, Promotions and tagged Analog Signature Pack, Compressor, Equaliser, Fairchild 660, four band equalizer, Limiter, Limiting Amplifier LM-662, Nomad Factory, Program Equalizer EQP-4, Studio Channel SC-226, vintage warmth. Bookmark the permalink.